Last week I gave you my vacation essentials that I take with me when I’m packing for a playful holiday with the kids. 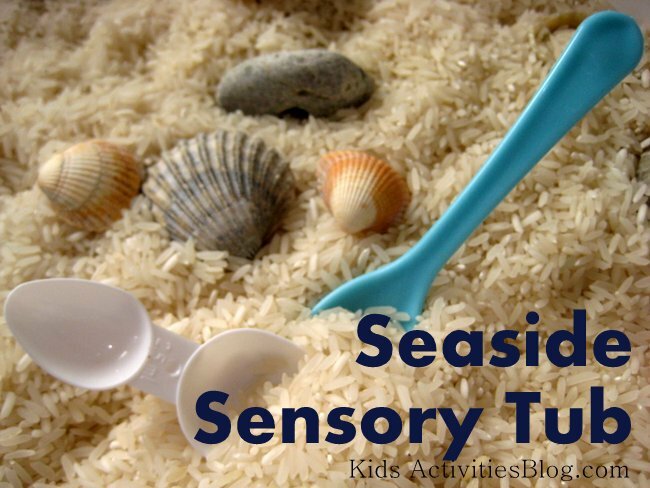 Today I’ve got an idea that keeps that holiday spirit going long after you get back home: a seaside sensory tub. We used some of our beach-combing treasures that we’d collected to make an imaginary seaside once we got back home. We started with a container – something big enough for a couple of children to play in together, but still easily portable so we can use it indoors and out. We found that an under-bed storage box is ideal. 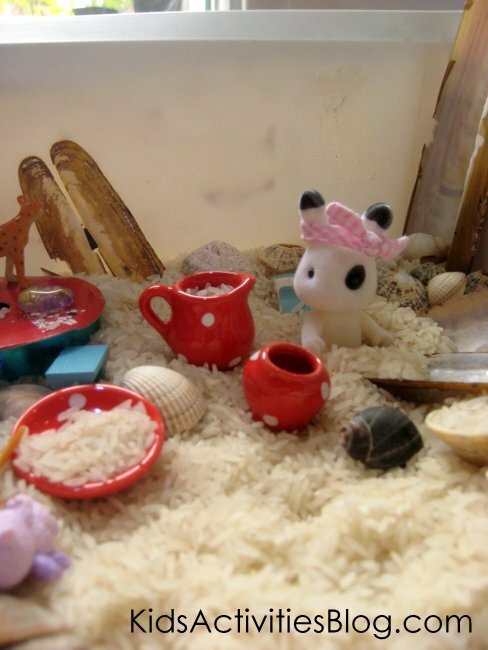 We’d been to a white pebble beach on our vacation, so we filled our tub with white rice to recreate it, but you could of course use sand, or try this idea for a rock pool. Then we added all the treasures we’d collected to bring lots of sensory textures and play possibilities: drift wood, pebbles, shells, dried seaweed. 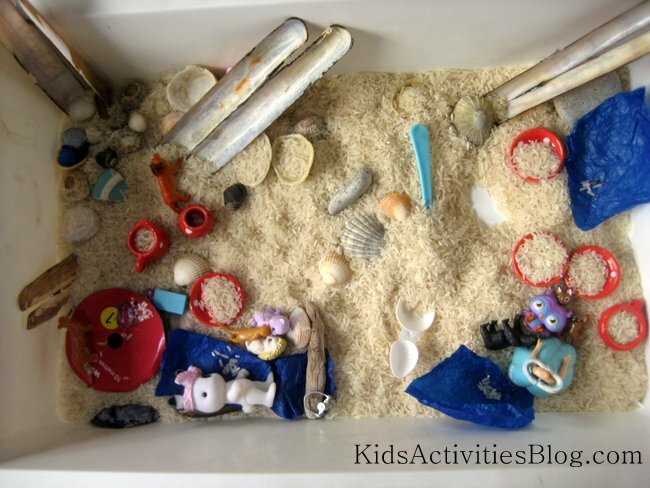 Younger children might love to simply enjoy touching and exploring all the beach items in the tub. My girls love to create imaginary lands so they brought their favourite characters along for a picnic day at the seaside. This kind of play gives children the chance to recreate adventures they’ve had on vacation, to tell stories and practice new language, as well as learning how to co-operate with a friend to enjoy some play together. Rebecca has some other lovely ideas for preserving travel memories. And Holly has a great idea for a memory jar made of collected vacation treasures. MacKenzie shows you how to make a lovely beach craft keepsake with shells collected from a beach vacation. How do you keep vacation memories alive as summer fades? Previous Post: « Get 15% Off All Renee Rouleau Skin Care Products August 17-26! With this bin you can play in the sand year round.